ATHENS (Reuters) - Greece's first foray into bond markets after a four-year exclusion will be on a "trial and error" basis but the nation expects to fund itself unaided in 2016, its finance minister told Reuters on Wednesday. Buoyed by bond yields at a four-year low and a long-awaited deal with EU/IMF lenders that has unlocked more aid, Athens says it could issue debt as early as within the next three months. "Now it is the right time - after all the good news we've had - to enter markets," Yannis Stournaras told Reuters at his office overlooking Greek parliament in the central Syntagma square. "The mood has changed dramatically recently. Simply look at what happened at Eurogroup - everybody thinks that Greece now is out of the woods." The Eurogroup of finance ministers met in Athens this week, attracting about 5,000 protesters who denounced the latest measures agreed with the European Union and the International Monetary Fund to try to make the economy more competitive. Greek officials have previously told Reuters the initial post-bailout bond issue will likely be for 2 billion euros ($2.75 billion) of five-year bonds by June, but Stournaras declined to comment on the sum, saying only that the initial issuance would be "small". "It will be a trial and error process," he said. "What we need first of all is to smooth the yield curve and second, it is time to see how markets react, because at some time in the future we have to enter markets completely and finance all of our needs through markets." A return now would be among the swiftest comebacks by a country from default, given Greece imposed losses on private bondholders in 2012. Asked if Athens would consider a second issue later in the year, Stournaras said: "If we think that markets are suitable for any extra issuance we might attempt it but for the moment we consider it a trial and error process." There was "huge appetite" from foreign investors for the issue, Stournaras said. He reiterated that Greece did not need additional financing beyond its current bailout program for the next year and hoped it would not need fresh aid for the year after that. "Definitely we don't need new money for the next 12 months. Then for the other 12 months under certain conditions we might again not need more money," he said. "Then, I hope, after that Greece will be fully ready to access markets completely," he said, confirming that would be in 2016. After nearly crashing out of the euro zone in 2012, "Greece is back," Prime Minister Antonis Samaras declared earlier on Wednesday. Economic data has begun to show signs that a six-year recession is ending, and the government says it posted a budget surplus before interest payments last year, making it eligible for further debt relief from its partners. 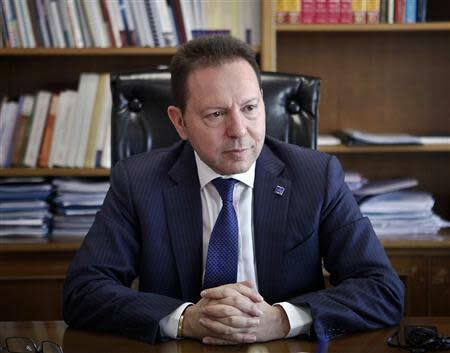 Stournaras confirmed Athens would start discussions on further debt relief from its partners once that primary surplus, which he estimated at 2.5 billion euros, is confirmed by the European statistics agency later this month. Stournaras expects Greece to post growth of 0.6 percent this year, and unemployment to start falling this year after peaking at 28 percent.